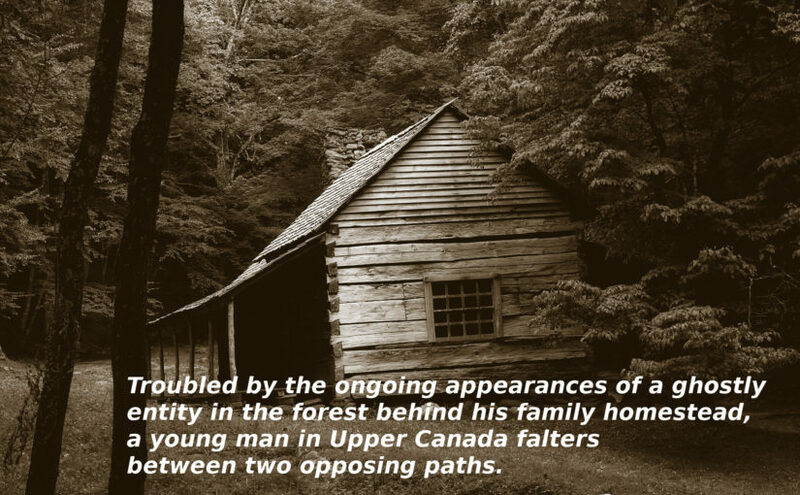 “Ghosts are the superstitious nonsense of heathens, son,” Pa used to say, but I’d been haunted by one in the forest behind our homestead through much of my childhood. I was about five years old the first time I saw it. A white entity moving deep within the trees at dusk. Then again one grey afternoon a couple of years later when I was mucking out the stable, and heard a crackle of movement on dead leaves. Gripping my shovel in front of me like a protective spear, I peered into the nearby treeline from whence the sound had come. We lived in a forest in Upper Canada, trees furrowed and thick, undergrowth prolific and tangled. In some directions you could trailblaze for days without encountering a single trading post or homestead. Yet there it was some fifty feet within and as tall as a man: a flash of white appearing for a second between tree trunks, disappearing behind others, and reappearing again as it seemed to float along. However, though I strained to see its contours, I could not piece together its form; and as soon as it was there, it was gone. These apparitions occurred only once or twice a year and always in the same manner: at dusk or predawn, and only when I was working quietly by myself. The times when I helped my father chop wood and gather kindle from the forest, I always kept an eye out for it, but whether due to the reverberating splitting sounds, or the trampling of twigs beneath our boots, it never showed itself when I was with him.